Disclaimer – This post is sponsored by Ryobi. All opinions are 100% my own. When I said we were gonna make our garage the most ridiculously awesome garage ever, I was directly talking about our garage door openers. I mean…the plan is to make this space not only look amazing…but to actually work FOR us. 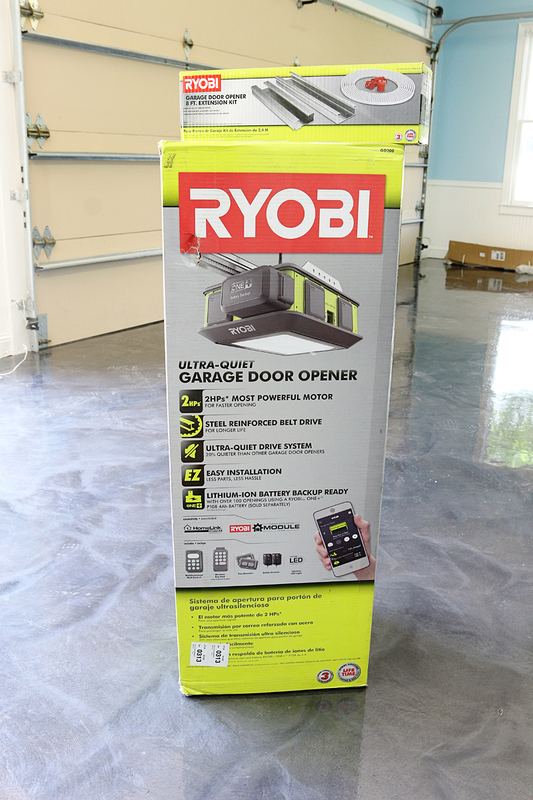 Having a garage door opener (aka GDO) that does just about everything….well, that definitely helps in the function department. You may be wondering where to get such a magical gift and how wonderful it would be to buy your dad (aka the man that has everything) one for Father’s Day…..well, if your dad is anything like mine….and he probably is if they talk about the state of their lawn and fall asleep with remote in hand….he will flip over it. Trust me. Your dad will qualify for Cirque De Soleil after seeing this thing. Jeremy installed our old GDO’s and so he felt comfortable getting his hands dirty on this one. But if you are not a DIYer, The Home Depot has installers that went through extensive training on the ins-and-outs of hooking it up and teaching you how to use it. If you are a DIYer, Jeremy said that the most helpful thing was to have the installation video online that shows you how to get-er-done. The process for our house was fairly straightforward because we were replacing an existing garage door opener. Unplug, de-wire, and un bolt from the supports…. Then detach from the door arm…. and lift the old track away from the bracket. Then you can remove the entire motor and rail. This part took about ten minutes tops. The kit comes with an extra long belt and a couple extenders for adding to the rail. This took five minutes to prep by piecing it all together and making sure the belt was in place. Once the rail is attached to the motor box and the new bracket is in place, you can start the hooking-back-up process. It’s really straightforward especially with the step-by-step instructions and even though I was standing there waiting to help, Jeremy handled it LIKE A BOSS. Seriously…he needed zero help from me and before I knew it, the garage door opener was up and running. That’s when the fun part came. He told me that there were MODULES. I know that sounds like a word that could be disgusting or creepy or slightly contagious….but in a hot minute, you will wish you had them. So on the sides of the motor box are these little black doors. Those are module spots and let me tell you….this is a game changer. Okay – before I go on, Jeremy wants me to stress how important it is to make sure your sensors are aligned and hooked up properly. Safety first people. So the modules are different accessories. Think bling, flair and function for your garage. They make a fan, a bluetooth speaker, an extension cord, even a parking assist module! Not only is the GDO ultra quiet, have a built in light but now you can party, keep cool, park like a pro and open the door even when the power goes out! Yup! Back up battery blowing your mind right now. AND did you see the extension cord? So that means you can vacuum your car out in a snap! WAHHHHT?! And there is more – one of these bad boys for outside the door so you no longer need to suffer through carrying your keys everywhere! It’s Crazy. I capitalized that for emphasis because it’s so amazing. The app can tell you if the door is open or closed, control the motor, the speaker, the fan, the whole shebang. I was telling one of the moms at baseball about this thing and she immediately went to Home Depot to get one because she has teenagers who always forget to close the garage door. So now she can tell if it’s open and be able to close it at work. AND she can put the app on the kids phone so they can open the garage door when they get home from school! It’s all password protected so security is not an issue! And I can control it if my mom shows up to my house and I am not there yet! It’s just the best use of technology when it comes to garages. But the best way for us to tell you about this thing is to just show you with this ridiculously cheesy video. Um…you all are just the cutest! And that GDO makes me really miss having a garage! YOU AND THE TENNIS BALL!!! I snort laughed. At work! Ha! Am I crazy, or are you and Jeremy in THE ZONE- professionally and relationshiply? It just seems like you’ve both hit some new high in your lives separately and as a couple. Way cool! I just put in the Chamberlain wifi/deluxe GDO. 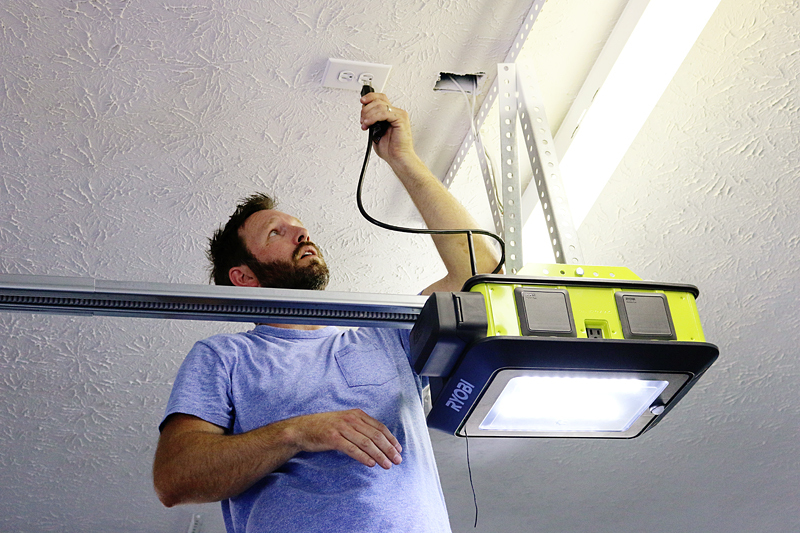 It is cool to open your garage door from anywhere, or check it. Plus you can set a timer so your door closes automatically after x minutes open, if you want. I like that feature, too. Oh my word – that looks life changing. Our garage door opener has been broken for so long and we have to open and close the old fashion way! You are definitely inspiring me to want to get into my garage and give it a grand makeover!!! Glad you posted this because I didn’t really know you could install one like this on your own, I thought it had to be connected to AT&T or something like the one we have now in order to open with an app. We have used that feature a billion times so I would LOVE this! Thanks! You guys are seriously the cutest, I love how much fun you have! Control from my phone? Mic drop. Also, this would really help my OCD. I turn the car around almost every morning to double check that the garage is shut. Doh! This looks awesome, but I see reviews about the beeping/safety noise when it closes.. your thoughts on it? The video made me LOL! 🙂 the keys!! Haha!! I like having the beep…it is a warning that the door is closing and a clear reminder that little kids should be out of the way. Especially since the door itself is quiet, that safety warning is a good thing! I know that the reviews are probably from people that don’t have little kids around but I have FOUR that are perfectly sized for getting smooshed so I am a fan! Oh that is so sweet. I really think that this garage is helping us focus on getting things DONE! I love the video !!! Haha..the tennis ball !!! You guys have really kicked up the blog a notch in the last year and I love it. I mean, I just watched a video about a garage door opener. That’s saying something! Nice job and hopefully you enjoy it as much as it seems you are. Haha totally agree. Thanks for the insight–that video is the bomb. And your Mariah video on Insta–dying! Anything my phone controls makes me feel some type of way. So…what is your take on the fan! Does it really help in such a large space? It doesn’t look that big?? But seriously….LOVE you guys…LOVE your blog…keep up the hard work!! The air flow definitely helps! I think that since we have two doors that having two high is helpful but I wish they had an oscillating option! 1. That is the most amazing video about a garage door ever made. 2. I need this GDO in my life. Keys in your bra. Me, too! you guys crack me up! Thanks for the laughs (and informative too!) win-win!! !